Just when I thought I was done with my 2014 year-end reflection, another reflection popped in my head and it’s bugging me to give it air. You know you are doing something right in life when the lessons that will help guide you to the next level of your evolution appear to you versus you having to search for them in a given experience. Right around the time when adulthood got hard or got real, I made sure to learn everything I could in the hardest moments because I hoped to never experience the hardest of hard moments from my life again. To both honor and remember each of these significant moments, experiences or lessons I started to label each experience as accurately as I could. It was my belief that if I could remember those hard moments or profound lessons from my life, then those experiences wouldn’t be repeated. Now that I am older I know that life will test you and test you often to see if you either superficially, intellectually or deeply understand a lesson. The test results play out when we show life to what degree we can face (or not face) the same or similar experience from out past. When we respond to the same or similar experience in a different, mature way then we did well to learn from our past. 1. Letting go and ultimately surrendering. One of my goals for last year was to let go of my grip on life. As the year went on, it became clear to me that I needed to take the goal a step further. I needed to let go of anything and everything that wasn’t working for me and I let go of any safety net or harnesses that I felt I needed to hold on to. Towards the end of last year, life pushed me to let go even more which lead to me to surrender. I feel to a large extent before I even surrendered to life when times got really hard, there were moments throughout the year where I surrendered and I didn’t know it. 2. Taking a leap of Faith. I decided to take a “leap of faith” as a response to how I was feeling about where my life was headed. Since I moved to LA I longed to balance my life between my personal life and work. Between the two work always won. I am not a workaholic, my industry is just very demanding. Over two years I questioned my life and the direction it was headed. The more I realized about my life, the more I questioned is this the life I want? After a series of events in 2012, I grew tired. I set out to balance my life in 2013 and since my life has never been the same. In late January/ early February I felt a pull in heart which lead me to question even more. I thought for weeks about the answer to the question. After speaking with a mentor, I realized that my whole life I took only calculated risks all of which I achieved. Calculated risks are good risks to take. But for me, they are no different then staying close to a safety net or harness, which went against my 2014 goal to let go. It seemed logical for me to take a full risk in the direction of my heart. I know it sounds absurd to take the risk, but it felt right in the moment and I tried all other paths before I took the risk in the first place. Since that leap, my life has shifted greatly. That leap impacted every part of my life from my month of writing to the turbulent tides from the fall. The impact is still felt. My life is still shifting. The jump was not an easy jump to make, but I did it with my whole heart because I want to reach my full potential. I feel pretentious calling myself brave, and that’s why I ended the statement as a question. I do not feel brave. There was not a moment of last year where I felt brave. Many, many times last year I was scared or straight terrified at what I chose to let go of and face. Since July of last year there were many moments where I felt I could not go on. I really wanted to abandon my leap and my goals because it is the stripping away of a conditioned way of seeing, thinking and being that I was accustomed to. Why would I label last year as being anything close to brave? That label came up each time I checked in with friends and mentors and told them about my journey last year and my experiences. They felt what I had accomplished and what I was seeking to achieve in my life was nothing but brave. It is very humbling when friends and mentors call you brave. I appreciate the label, but I question it even upon reflection because brave doesn’t feel brave. 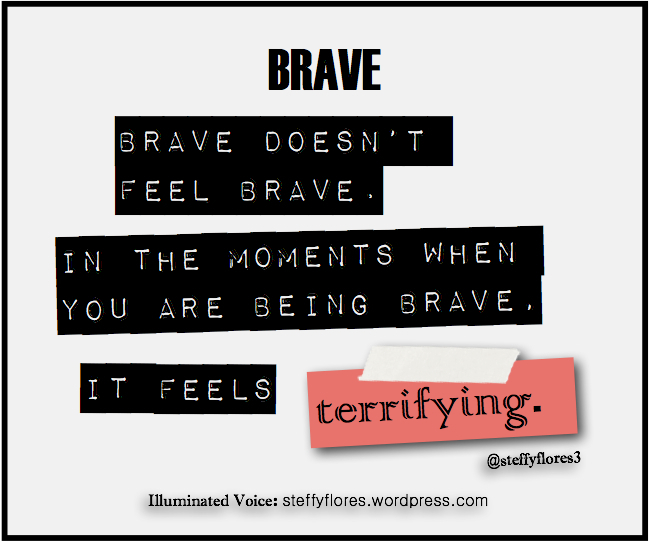 In the moments when you are being brave, it feels terrifying. Which of the labels that I listed for my life, do you feel most applies to me and why? How would you label your most recent profound experiences? How would you label what 2014 was for you? Thank you so much for your comment. I have been reward greatly. This year has already provided many blessings. It made last year that much more special and worth it! Are you kidding with the question mark, kiddo? Brave. Put exclamation marks after it if you want. What you did takes bravery beyond belief–and most don’t do it. They lead lives they no longer like. I hope you’re rewarded for the leap!